The idea that Aethelwalh, king of the South Saxons, was the third son of Cynegils and that Penda might have appointed him as the king in Sussex, gave birth to the Nothgyth Quest Hypothesis. 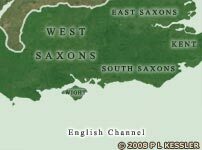 It is now to be conjectured how a South Saxon Witenagemot of hereditary nobles might have operated during the later monarchy in Sussex (which is known to have existed), on the scant evidence available. For instance, there may be undocumented evidence that the leading chieftains east of the Adur might have retained considerable independence of action, until Offa's conquest of Sussex in 772. This assumption could explain why Aethelwalh, in spite of his having married a Christian princess (and probably having allowed his children by her to be baptised), and in spite of his receiving baptism in 675, had to bide his time before getting his South Saxon people converted to the new faith. As is recorded, the exiled Wilfrid began this mission in 681. Further, Lesley suggests that it remains questionable how far to the east Caedwalla was able to press his intended conquest of the South Saxons, although Bede implies that they were utterly beaten. Certainly, to judge by the evidence of the extant Selsey Charters, it might not have been till the reign of Osmund, and beyond, that royal land grants were usual east of the Adur. Going by the two dynasties postulated in the main text, it would seem that until, the 760s the South Saxon Witenagemot favoured the House of Aethelwalh, originally installed by Penda. Bearing in mind the conjectured members of the two royal families already discussed, Nothhelm probably had at least one brother. Yet it appears that King Ine, recorded as a kinsman of Nothhelm, was persuaded to install Watt, and then Aethelstan as Nothhelm's co-rulers, and, as has already been contended, to promote Aethelberht to kingship after the death of Nothhelm. Again, following the possible membership of the two dynasties, whereas there seems to have been no campaign to elevate Osric to kingly status, there was armed support for the dissident Ealdberht. It is proposed here that this military backing was supplied by certain members of the agnatic Witenagemot. Conversely, it is also contended that, after some three decades of Aethelberht's centralising policy around his ministers, members of the conjectured Witenagemot, whose powerbase lay east of the Adur, began to support Osmund and his younger brothers. These supposed relationships have been put forward in the main text. There could have been a plot, since if Ealdberht was Aethelberht's heir, as has been surmised, then the old king would very likely have expected support for his atheling from all the Witenagemot. On this presumed basis, it could be said that a regime change on the death of Aethelberht, probably in 758, would have been difficult to avoid. If this chain of events occurred, then the Witenagemot proposed in these notes was soon to lose all vestige of its former power. Further, the idea proposed here that Aethelberht might have adopted a centralising policy in Sussex, takes into account the possible influence of the administrations of Charles Martel and Pepin Le Bref across the English Channel in France. Notwithstanding their presumed loss of influence, it is also argued here that the Mercian rulers of Sussex would have been glad of the loyalty of an hereditary witan of the kind proposed in these notes. Showing respect to the members of such an elite institution to secure them as loyalists to the Mercian throne would have helped the Midlanders maintain stability in their isolated province of the South Saxons, remembering that Surrey was part of Wessex. Perhaps this was particularly the case after the death of the last duke of the South Saxons, Ealdwulf. Lastly, it is also argued that it was this ancient, agnatic institution who surrendered Sussex to Ecgberht of Wessex after the historic victory of the West Saxons over Mercia at Ellendune in 825. Indeed, the Agnatic Witenagemot of the South Saxons, with a lineage stretching back to Ælle and his close kinsmen, for which it has been argued here, would have been the strongest thread in the identity of the South Saxons. Perhaps it was in the halls of these noblemen that the storytellers developed the Royal Legend referred to in the main text. Images are free from copyright. Text copyright © David Slaughter, BA Hons, ATC (Sussex), Blue Robe Order of the Welsh Gorsedd, expanded from material first released on the Anglo-Saxon Kings of Sussex blogspot. An original feature for the History Files.